During this session Kerri will connect to loved one or pets who have crossed over to the other side for information and answers to questions. Please note that while every attempt will be made to connect with a specific person at the request of the client, not all loved ones who have crossed over are always accessible, and no guarantee can be made that a specific loved one will come through. If the specific loved one cannot be contacted there is always a reason. Often another deceased relative who has information about that person is available to connect with. 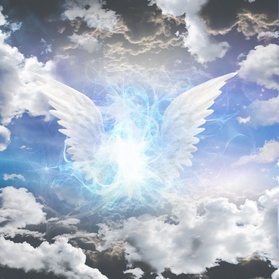 This session differs from a Channeling session in that during a channeling session Kerri is connecting to a specific spiritual frequency or 'channel' (Spirit Guide) who brings the information through. In the medium session, Kerri will be connecting to your loved one(s) on the other side for information, for messages, and answers to questions. To Help You Decide Which Session Is Right For You. If you wish to ask questions about your life, your guides, your health etc. and connect to a loved one who has crossed over but that is not the main reason for the session, then a Channeling Session is best. If you wish to only ask questions and/or have a conversation with departed loved one(s) or departed pets and that is your sole focus, then (you are in the right place) and the Medium Session is best. If you have health issues and need healing and would like insight into health or body issues, as well as messages from Spirit then an Intutive Reiki Healing Session is best. Please come to this appointment with your questions and prepared to take notes (if you like) in order to get the most benefit from this session. This session is also available as a distance session (over the phone or via Skype). Distance sessions are just as accurate as in-person sessions. Kerri does not need to see photos or hold objects (psychometry) to connect. She can connect easily to loved ones who have crossed over without the use of any tools. Please call 905-689-8100 or EMAIL HERE to book a distance session. A medium is someone who can communicate with those in spirit. Are Psychics and Mediums the Same Thing? No, it's a common misconception but Psychics and Mediums although having similar qualities, they are different. Psychics use their extrasensory perceptions to ‘tune into’ your energy field (think of the way you tune into a radio station). They can tell you about your personality, the path you are on, etc. They 'read' your energy. They may or may not have Mediumship abilities. Mediums specifically communicate with those in spirit. But mediums are also psychic. Do You Need To be In The Same Room or Geographical Location as The Medium To Have An Accurate Reading? Not at all. Most people prefer the 'in person' approach but Psychic & Medium readings can be done in person or over the phone - there is no difference in the quality. You can be sitting in the same room as an intuitive person, or across the world - it doesn't matter.